It is strongly Recommended that You Retain Your Equity Shares. This seems to be a Trial Balance - May be for 9 months. PLEASE RECHECK THIS. Please do not take any Investment Decision based on this. Baggry India ( earlier named Ghaziabad Protein Food )is an Unlisted Company. 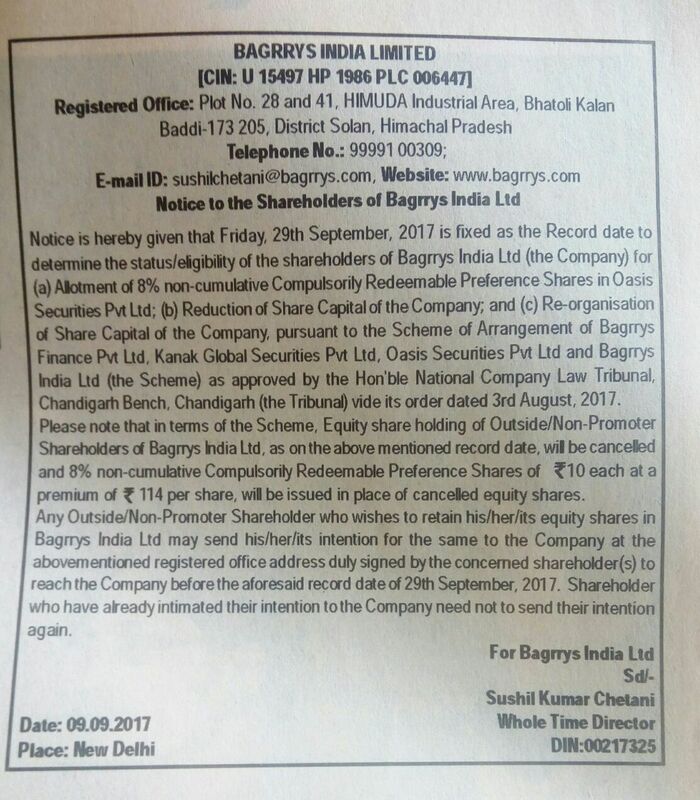 It seems to be be doing very well..
Baggry India is holding Court (NCLT ) convened Meeting of Shareholders on 24/06/2017 at Baddi ( Himachal Pradesh ) for reorganization . xi. Re-organisation of part Share Capital of Bagrrys India Ltd by cancelling the Equity Shares held by all non-promoter/outside shareholders and to issue 8% non-cumulative compulsorily redeemable Preference Shares of `10 each at a premium of `114 (one hundred fourteen) per share. i. The Transferee Company has some outside/non-promoter shareholders. Since the Transferee Company is an un-listed company, there is no mechanism/platform available to these Shareholders to sell/dispose-off these shares, if they so wish. ii. In order to provide an exit opportunity to all the outside/non-promoter shareholders, it is proposed to re-organise the share capital of the Transferee Company, on voluntary basis, by cancelling the Equity Shares held by all the outside/non-promoter shareholders; and to issue 8% non-cumulative compulsorily redeemable Preference Shares of `10 each at a premium of `114 (one hundred fourteen) per share. iii. The proposed re-organisation will provide a permanent liquidity option for illiquid shares of the Company. It will help the non-promoter shareholders in realising the true potential of their investments in the Transferee Company which can be gainfully deployed elsewhere. Bagrrys seems to be doing very well. In Jalandhar's Metro Wholesale Store Bagrrys's products were stacked in large quantity and were selling.